The Shroud of Turin is one of the most studied and controversial religious relics in history. It's a cloth that is said to have been Jesus' burial cloth and bears the image of a man that many claim is Jesus. It is around this mystery that Jim O'Shea has woven his story of intrigue, murder, and the supernatural. 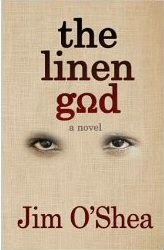 The Linen God is undeniably a page turner and was a favorite read of our church's book club. O'Shea's approach to the story line is a mixture of Dan Brown (Angels and Demons) and Frank Peretti (This Present Darkness). Grace Barden is in love with a physics student, Manny Lusum, who is a soon-to-be Catholic priest. Across the ocean, three grisly murders and the theft of a secret manuscript that contains valuable information about the Shroud of Turin thrust Grace and Manny into an old controversy of biblical proportions. From New York to Rome to the inner sanctum of the Vatican, they struggle to untangle the bizarre mystery that results in a confrontation between faith and the ultimate evil. It's an exciting read that keeps you intent on turning pages. One of our book club members said she was up until 4 a.m. because she had to finish it before she could sleep. So, warning: pace your reading to keep yourself from losing sleep. This is definitely a good book to tuck in your suitcase, read on the plane, or just curl up with at home and let the book take you on a trip to Rome and the Vatican and adventure.